Bosadvisors | Get SET! Career Transitions, Purpose, Impact, Choices – Your Journey. Get SET! 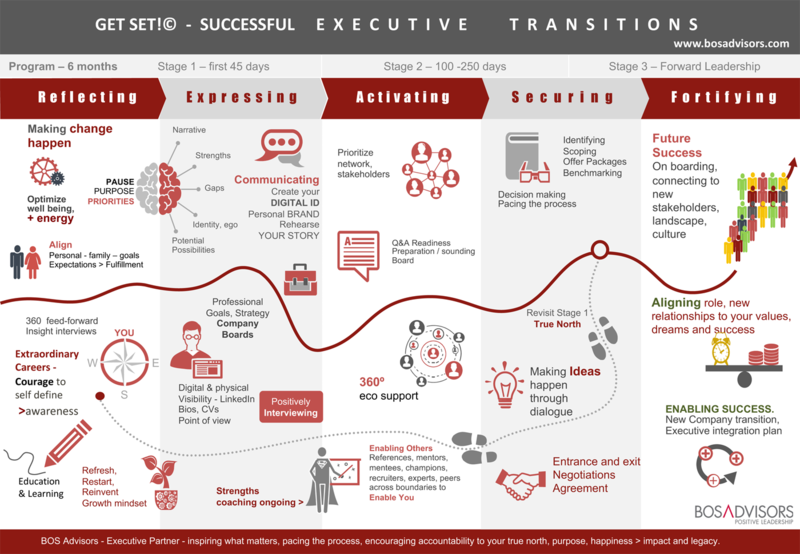 Career Transitions, Purpose, Impact, Choices – Your Journey. A career is a journey, often with surprising turns. Connecting with your passion and authentic self before the unexpected professional shift will help you ease through inevitable transitions. Through SET, you cultivate the skills to lead change rather than allowing change to happen to you. Take a PAUSE – create the space to reflect, refuel, review what got you to where you are and where you want to be in 1, 5, 10 years. What’s your purpose, your potential, your personal power? How do you build on this in order to create and live your plan, whether it’s relocating, starting a company, taking on a new leadership role or securing a board seat. With a breadth of experience across industries, cultures in learning and development, recruiting, talent management – and ultimately to building a global network to advance Balanced Leadership, Bos Advisors is the ideal partner to help you power, pace, embrace and lead your life transition. Mark Twain famously reminds us, “the two greatest days in your life are the day you are born and the day you find out why.” Do you know YOUR Why?